Click the button above to see what's in stock. 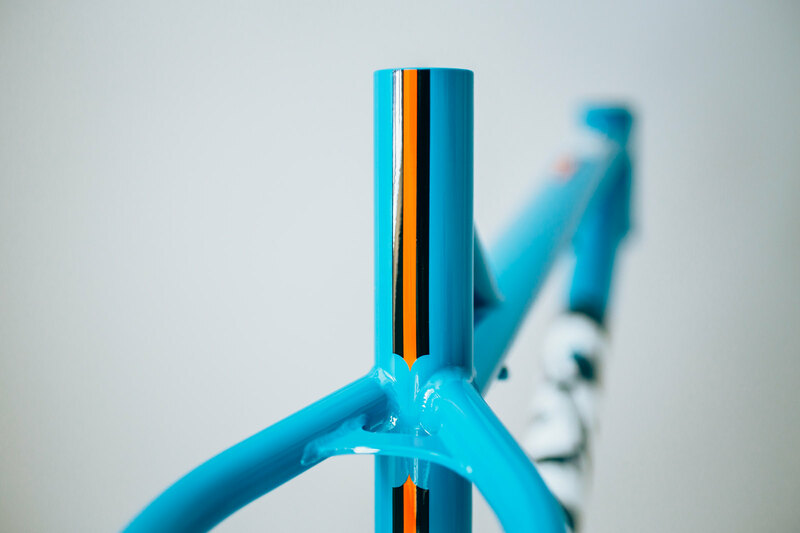 There are three build levels available, with lots of parts options, plus our Go Custom programme where you can configure even many parts of your build including shock, fork, wheels, tyres, bars, stem and brakes. All bikes are built to order: Your bike built for you. Frames from: £499 including Cotic seat QR and delivery to UK, Ireland, mainland Europe, USA and Canada. Select extras like headsets, bottom brackets and Cotic merchandise are available with your frame, and prices include fitting. Click on ORDER FRAME button to see your options. 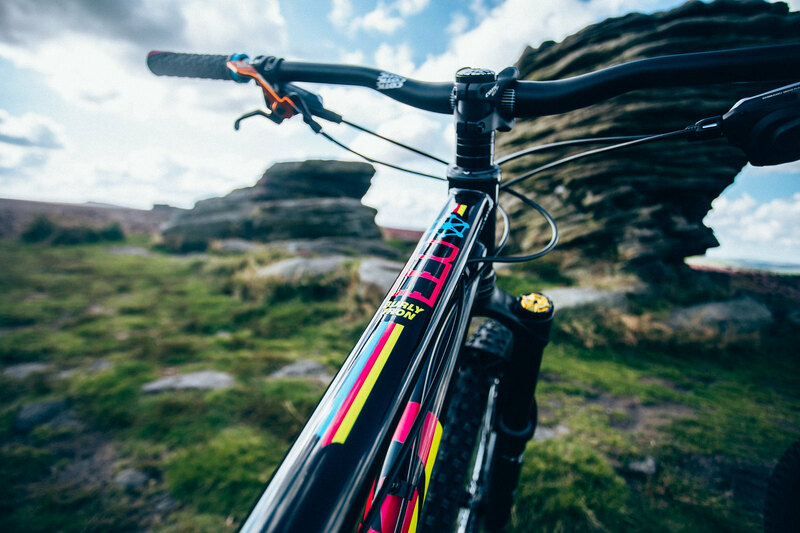 The BFe is our trail bashing, downhill thrashing, jump park smashing, enduro winning, do-it-all fun machine. Right from its introduction in 2005, the BFe has always been the tearaway of the Cotic family. The Soul's stockier, rowdier younger brother. You know the one - loads of fun, but a bit on the wild side? That's the BFe. New for 2018 is an Extra Small (XS) size so everyone can enjoy some hardtail shredding, and we have introduced a gorgeous Champagne metallic paint option. Re-invented for its 5th generation, the latest BFe takes the biggest step forward in geometry and features since it was first launched. During our focus on the droplink full suspension bikes over the last couple of years, we got to wondering.....what would a hardtail with Rocket style geometry be like? The answer is here in the new BFe: It's longer, slacker, lower and more capable than ever. And fast. It's so, sooooooooooo fast! The BFe has always been a diverse beast: Down size and mount up with a 120mm fork and it is suited to smash the dirt jumps, local BMX or 4X track, with the geometry of the bike making it easy to throw down style and tricks like there is no tomorrow. 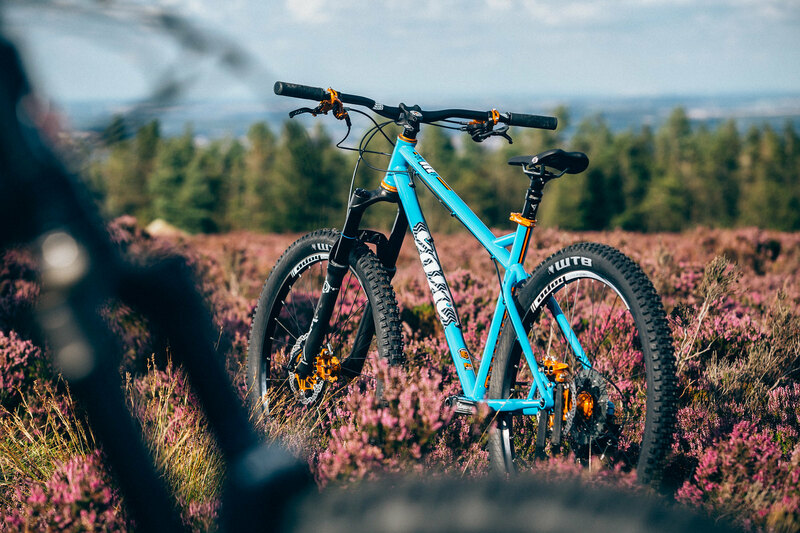 With a 140mm fork and sized with room to move, the BFe turns into the dream trail bike which climbs nearly as fast as it descends whilst keeping a huge grin on your face! When suited up with a 150mm-160mm fork the BFe will have no qualms about keeping up with your mates on their big fancy full-sus rigs at the enduros. The BFe can comfortably handle up those big forks so you can get hooning on near enough any downhill track you choose! The frame is based around a Reynolds 853 down tube, which allows us to keep massive strength where is matters most, whilst keeping weight down. 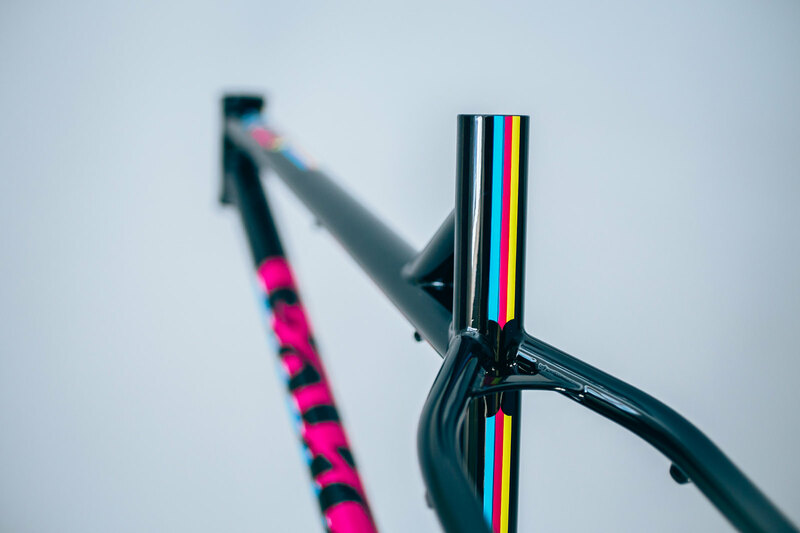 The rest of the frame is our own FM Heat Treated double butted cromoly steel, which help keep strength and value high throughout the rest of the frame. There are no corners cut: All the usual Cotic features of Ovalform top tube, oversized plug welded seat tube, wishbone stays, Syntace thru axle dropouts, stealth seatpost routing and taper steerer compatible head tube are all present and correct. 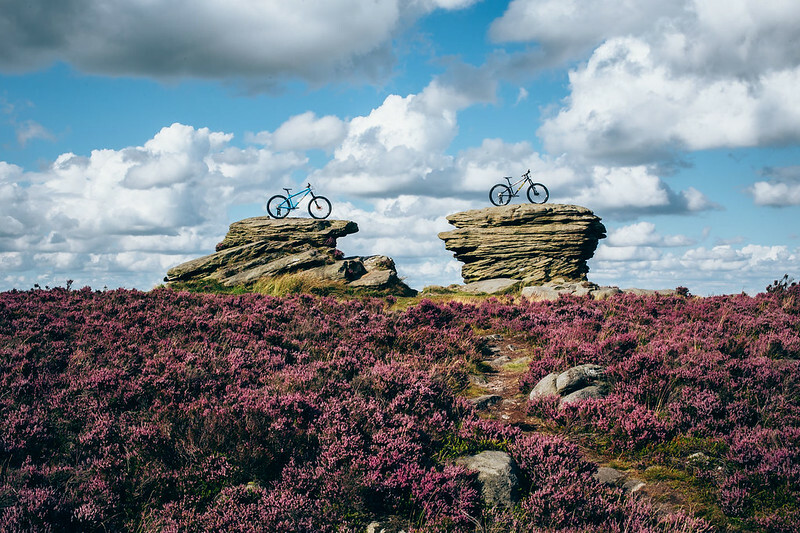 Throw in massive clearance for latest generation wide rubber - 27.5 x 2.6” or 26 x 3.0” tyres - and you'll be taking on all terrain in your stride, giving you the confidence to ride faster and be buzzing to do “just another run”! Complete bikes start with our no nonsense Silver build - which now features the fantastic SLX M7000 11spd drivetrain - then moves up to our high performance Gold level. 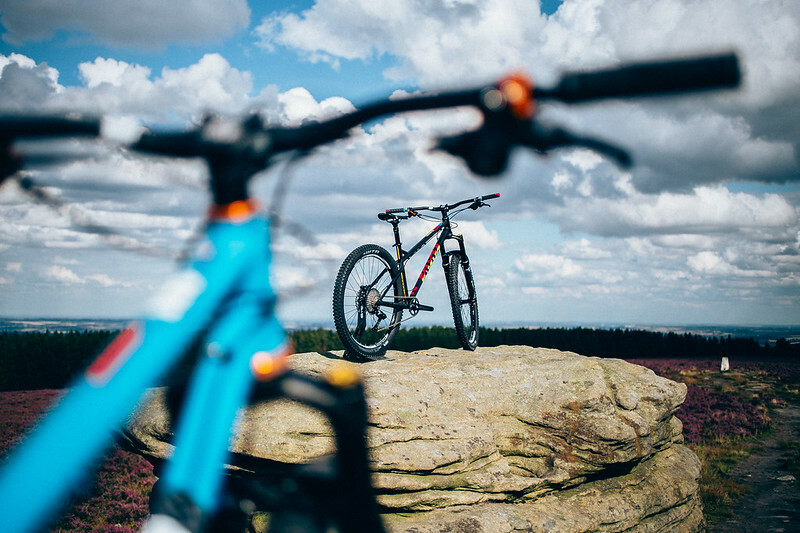 There are multiple upgrade options for each bike, including WTB Carbon wheels, Hope coloured parts, X Fusion, Fox or Rockshox suspension, and Joystick carbon bars. You can make your BFe your own. For more information, click on the tabs below. The BFe is also available frame only, for £499 with 142mm Syntace X-12 thru axle. Finish wise, you have a choice of CMYK (Cyan, Magenta and Yellow decals on Gloss Black paint), or Gloss Black paint with Orange/Aqua decals, or Gloss Cyan with Orange decal detailing. Trail, enduro, 4X, downhill, bike parks : BFe will do it all. Still want 26” wheels? You need the BFe26. Maybe you would prefer some 29er or 27.5 Plus wheels for your hardtail? Take a look at our smooth and supple SolarisMAX. Want to thrash your 27.5” wheels but add some suspension? You need the Rocket. NEW FOR 2018 - XS (Extra Small size) suits riders right down to around 4ft 11in tall. The gorgeous Champagne with orange details replaces the black/orange/aqua option. NEW FOR 2017 - Pretty much all new, that's what's new! The big departure for the 5th generation frame is the geometry. The BFe has traditionally been closely associated with the Soul geometry, but as times and riding styles change we felt it was time for the BFe to strike out on it's own. Shorter seat tubes on all sizes and dropped top tubes for a big increase in standover clearance. The short seat tubes also allow the use of dropper posts with at least 150mm drop on all sizes, and with the advent of 170mm and 180mm drop posts these are also more likely to fit the new frame layout. Longer reach across all sizes with larger steps between sizes. Our geometry research over the last couple of years has shown us that we much prefer the handling with short stems - particularly around the 35-45mm range. 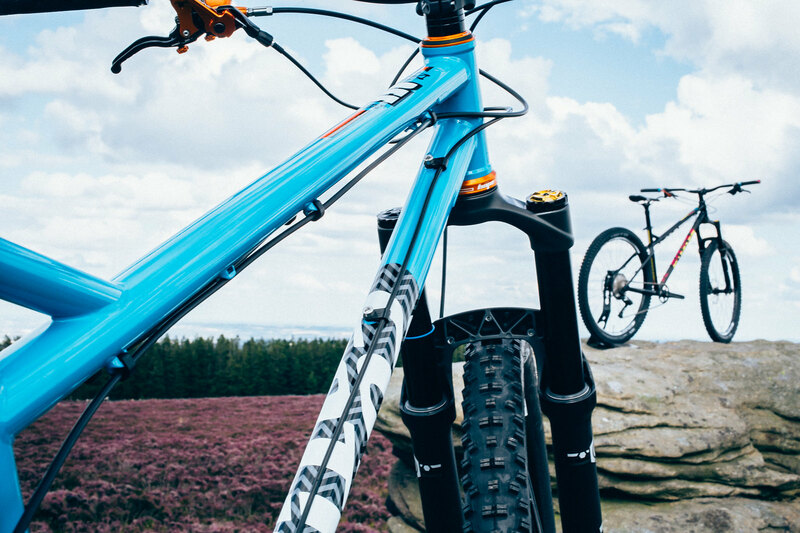 By lengthening the frames and widening the reach jumps between sizes this will allow more people to get a really short stem on their BFe whilst still having plenty of room to move. Slacker head angle - 66 deg at ride height with a 140mm fork. It's based around the Rocket front end. Works hand in hand with the short stems to keep handling lively whilst giving loads of feel and confidence. Optimised around 140mm forks. 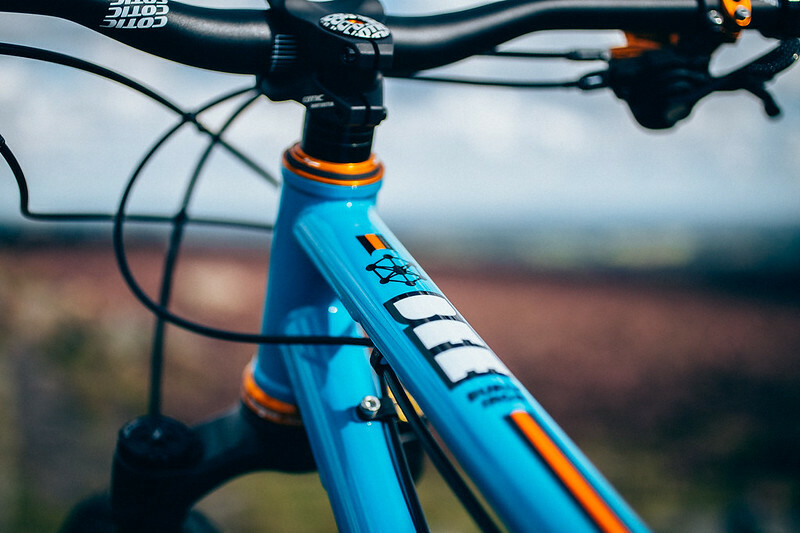 The BFe has always been capable of running 160mm forks and the new bike is no exception, but previous generations of BFe were designed around shorter 100mm or 120mm forks for all round handling. This left them somewhat compromised for climbing when running longer forks, and as most people build their BFe with at least 140mm forks the latest bike has been designed with this in mind which will make the bike more usable across all the fork lengths you can choose for it. Steeper seat angle. This runs hand in hand with the two new developments above, but in stepping away from our OFI geometry we have steepened the seat angle, and this combined with the optimisation around longer forks means the seat angle will be up to 2 degrees steeper than the previous generation frame for a given fork length. This keeps you in the middle of the bike and when combined with the long reach and short stem gives brilliantly poised handling when seated. Lower BB - the new bike has a 43mm BB drop when at ride height with 140mm forks. Keeps the bike planted even when running the latest large volume 2.6" tyres. The tubeset is carried over broadly unchanged as it's just the best compromise of weight, strength and price we can strike. The chainstays are new on the BFe, but shaping is carried over from the SolarisMAX. These stays give room for 27.5 x 2.6" or 26 x 3.0" tyres whilst maintaining the 16.9" stays. Geometry with commitment! Minimum 100mm travel forks, optimised around 140mm forks, maximum 160mm forks. All our bikes are hand assembled to order here in Sheffield by Paul, Cy, Will or Richard. If there's anything on the spec you're not sure about, or don't need, give us a ring to discuss. We'd much rather leave something off you don't need and charge you a bit less. Better for you, better for us, less waste, so better for everyone. 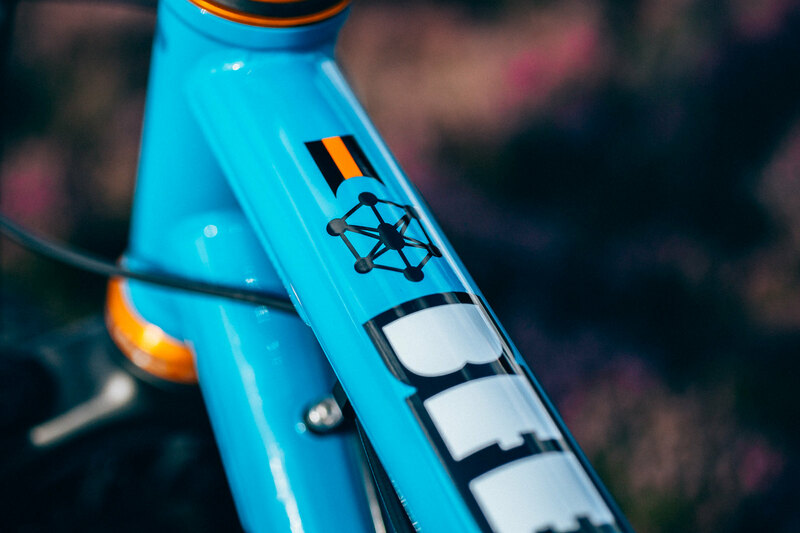 When ordering, you can choose key components to help you get the fit you want on your bike (contact us if you need help), but you can also Go Custom if you want to personalise your build still further. Price: from £2449 (UK only). Price: from £1749 (UK only). The chart is a guide to frame size. The BFe features Longshot geometry. 27.5 x 2.6" / 26 x 3.0" 27.5 x 2.6" / 26 x 3.0" 27.5 x 2.6" / 26 x 3.0" 27.5 x 2.6" / 26 x 3.0"
All measurements are based on 160mm travel fork with 25% sag (i.e. rider on board). Seatpost minimum insertion is guidance based on leaving 25mm clear below the actuator for any hose or cable to route through our frames. Your post may need less, or more, or if you use an externally routed dropper you won't need this margin at all. 4'11" - 5'4" 5'5" - 5'8" 5'9" - 6'0" 6'0" - 6'3"
All measurements are based on 160mm/6.3" travel fork with 25% sag (i.e. rider on board). Seatpost Maximum insertion is guidance based on leaving 25mm clear below the actuator for any hose or cable to route through our frames. Your post may need less, or more, or if you use an externally routed dropper you won't need this margin at all. All measurements are based on 150mm travel fork with 25% sag (i.e. rider on board). Seatpost Maximum insertion is guidance based on leaving 25mm clear below the actuator for any hose or cable to route through our frames. Your post may need less, or more, or if you use an externally routed dropper you won't need this margin at all. All measurements are based on 150mm/5.9" travel fork with 25% sag (i.e. rider on board). Seatpost Maximum insertion is guidance based on leaving 25mm clear below the actuator for any hose or cable to route through our frames. Your post may need less, or more, or if you use an externally routed dropper you won't need this margin at all. All measurements are based on 140mm travel fork with 25% sag (i.e. rider on board). Seatpost Maximum insertion is guidance based on leaving 25mm clear below the actuator for any hose or cable to route through our frames. Your post may need less, or more, or if you use an externally routed dropper you won't need this margin at all. All measurements are based on 140mm/5.5" travel fork with 25% sag (i.e. rider on board). Seatpost Maximum insertion is guidance based on leaving 25mm clear below the actuator for any hose or cable to route through our frames. Your post may need less, or more, or if you use an externally routed dropper you won't need this margin at all. All measurements are based on 120mm travel fork with 25% sag (i.e. rider on board). Seatpost Maximum insertion is guidance based on leaving 25mm clear below the actuator for any hose or cable to route through our frames. Your post may need less, or more, or if you use an externally routed dropper you won't need this margin at all. All measurements are based on 120mm/4.7" travel fork with 25% sag (i.e. rider on board). Seatpost Maximum insertion is guidance based on leaving 25mm clear below the actuator for any hose or cable to route through our frames. Your post may need less, or more, or if you use an externally routed dropper you won't need this margin at all.